‘Minnow’ took a rest while her skipper worked like a Trojan. Children and adults had a great day celebrating two birthdays. There was a sigh of relief when the youngsters were in bed and all was quiet. I took about 3 ½ hours to remove the cabin windows. I’m glad I did, because they were not sealed properly, and in continuous heavy weather at sea, I think they would have leaked. The rusty bolts retaining the windows looked pretty awful, and rust streaks from them would only get worse. 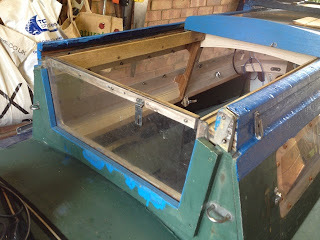 My next task is to take off the hatch window. Cleaning the Perspex may not be as bad as I thought. A light scraping with the blade of my penknife took off streaks of epoxy with little effort, but a slight marking remained. I have yet to experiment with the cleaning of the Perspex to see if I can make it presentable. Fitting out a boat requires a ‘go-get’ attitude. An effort has to be made by the one doing the fitting out. A boat is comprised of many components, and in the case of ‘Minnow’, several of them have not been up to scratch. 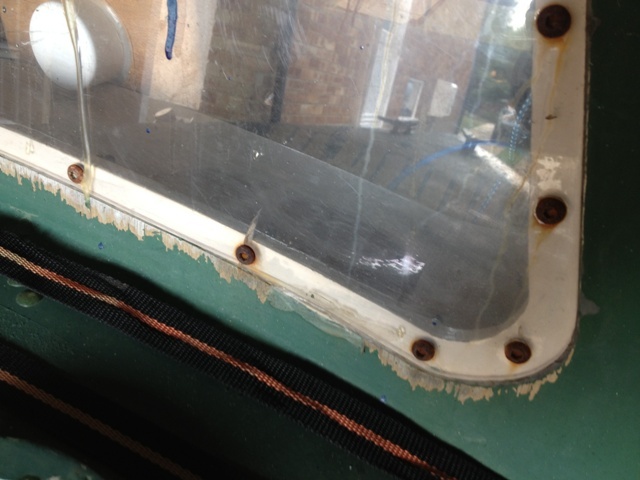 Seawater will quickly rust and corrode cheap metal, as is witnessed by the bolts retaining ‘Minnow’s’ windows. 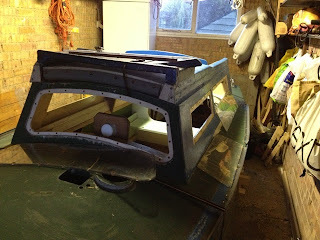 Stainless steel of marine standard or phosphor bronze will stand up to the test, but I suppose when Derek built her he was not thinking in the long term and saw her as a cheap and quick means of getting afloat. Galvanized pulleys suitable for a garden washing line cannot possibly be as satisfactory as proper marine grade ball bearing blocks which I have purchased today to replace them. Steering the boat will be a joy. Instead of heaving on the steering line and hearing grating noises from seized metal pulleys, I shall feel the tiller tremble in response to the boat’s movement through the water. My Autohelm 800 will equally respond by effortlessly moving the line, and at the same time it will consume less electricity than would be the case with the recalcitrant pulleys. While I was out shopping, in addition to buying bolts for the windows, I bought a tin of grey International Toplac paint for the hull, deck and cabin trunk. 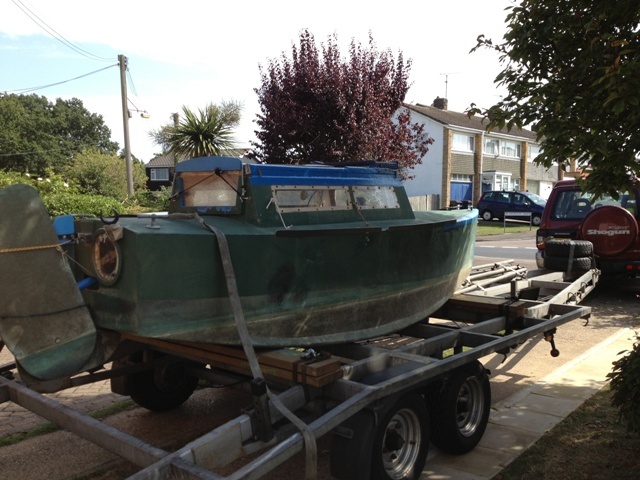 Grey will mask the scars and rough repairs given to this valiant sea warrior over the years. She is strong and stalwart, much deserving a name like ‘Warrior’, ‘Valiant’, ‘Gladiator’ or ‘Fighter’. ‘Commando’, ‘Red Beret’ or ‘Paratrooper’, might also suit her character. I can look forward to the mind-numbing job of replacing all the bolts retaining the windows and the hatch light. While I’m about it I shall have a go at cleaning spilled paint and epoxy off the Perspex, but I do not think I shall have much success, in particular removing the epoxy. I shall attempt scraping off the old sealant and applying new. All voids in the mast have been filled with epoxy putty and it has been sanded ready for a primer. I was surprised to find the mast did not fit snugly into vent box. 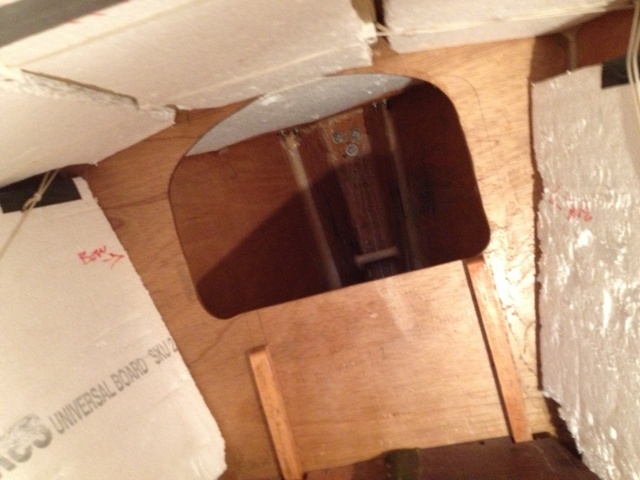 The cross-section did not match the shape of the hole through the deck, nor was the foot shaped correctly. I couldn’t insert the mast fully into the socket at the bottom of the vent box, because a wad of epoxied woven roving was in the way. Remedial work to put it right will not be easy, on account of limited accessibility. Wedges between the deck and the mast can solve the poor fit problem; in fact such an arrangement could be better than having too perfect a fit, because the mast can swell when wet, making it almost impossible to extract. That happened twice with ‘Faith’. An old wooden spoon fits perfectly into the slot aft of the mast, and its handle is useful for levering it out. 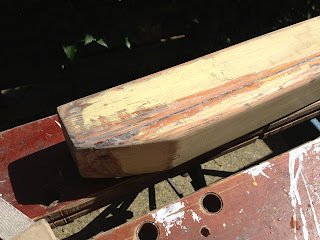 A thin wedge on the starboard side of the mast will make it fit perfectly. 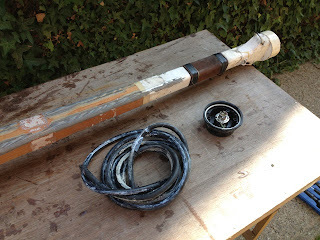 All I have to do is find a way of removing the wad of epoxied woven roving within the socket for the foot of the mast. 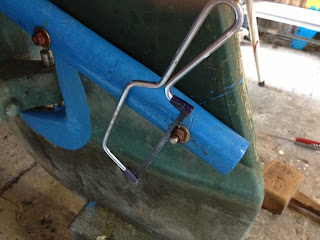 The rudder was difficult to take off because I could not undo two rusty nuts retaining the tiller to the stock. I had to saw them off and lever the tiller away from the stock. The rudder could not be dropped from the lower gudgeon without first removing the tiller. An initial inspection of the hangings did not reveal anything untoward. Both the rudder and the stock would appear to be solid. 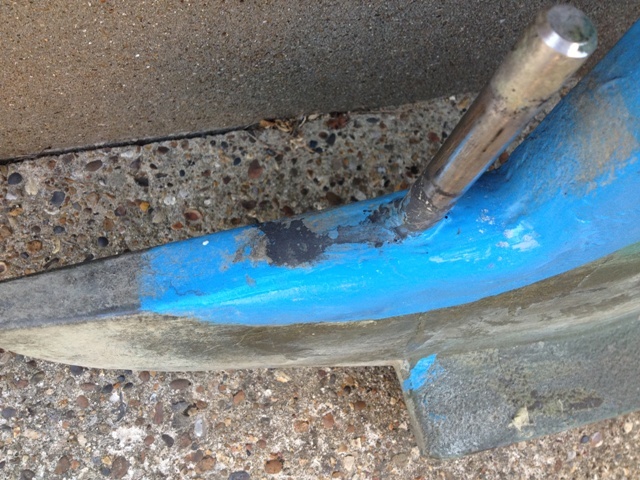 A washer was missing from the retaining bolt on the starboard side of the rudder. That presented an unfair load which could have damaged the rudder. If I have a chance tomorrow I shall try sorting out the yuloh rowlocks. Technically, there should be a pin on which the yuloh articulates. A rowlock causes unnecessary friction and it does not allow the yuloh to move freely. 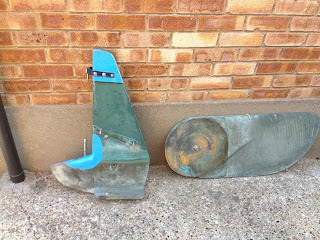 I shall have to work out how to fit an outboard bracket. 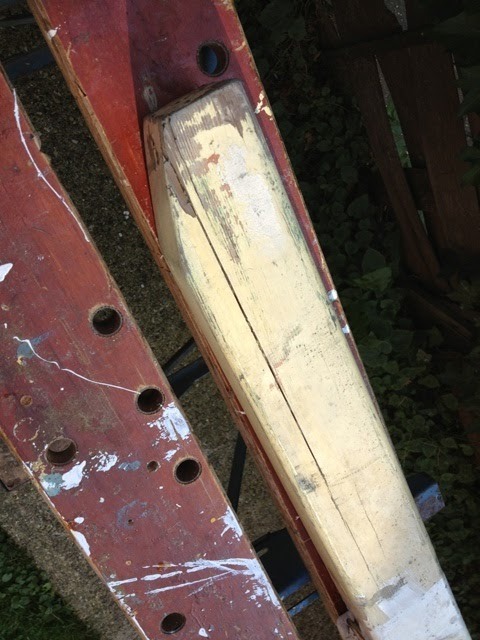 Having fixed one before to ‘Faith’, I may not find it too difficult, but I think I may first have to remove a large piece of wood from the transom. 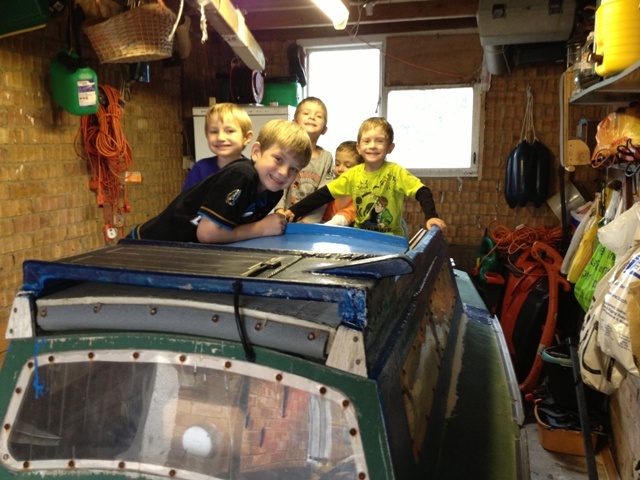 A bumpkin could be the solution for keeping the sheet clear of the outboard. 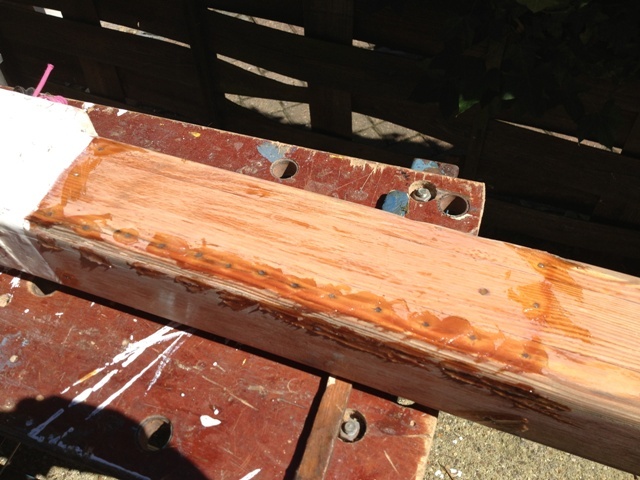 I have now filled in the voids on the mast with epoxy putty. 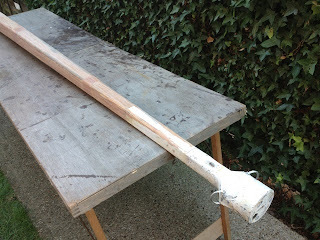 Tomorrow, I’ll sand the mast so that it is ready for a coat of primer. While I had the epoxy on the go, I filled in a void on the starboard chine runner, and I filled other voids at the front of the cabin top. I checked the steering and found that the pulleys for the steering line were slightly corroded and they did not run smoothly. That was the main reason why the steering was stiff. The line was worn and I must put in a new one. I shall be buying good quality blocks to replace the galvanised ones. They will make a lot of difference, because I shall be able to feel the helm. Unless I can feel what is happing, I shall not know if the boat is balanced, especially when on the wind. Too much weather helm will slow her down, and lee helm will be no good for going to windward. She will sail best with a neutral helm, as did ‘Faith’. I spent a while in the cabin removing bits and pieces that could be potentially dangerous because of being sharp and protruding. The ends of two bolts retaining the capping pieces for the side ballast where particularly unwelcome; not just because they could cut into any part of my body coming into contact with them, but they would puncture my self-inflating mattress. I got rid of a retaining strap over the floor lockers because it would not have functioned properly, on account of being fixed with copper tacks which would have pulled out when subjected to a heavy load. In any case, the strap was irritating because it had to be moved every time the floor lockers were opened. 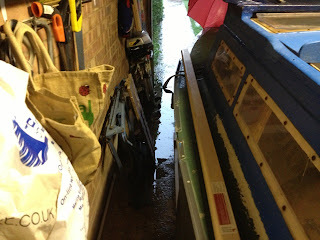 A fixed bilge pump in the lazarette took up a lot of room and got in the way; therefore I took it out. The pipes were the biggest problem, because they seemed to be everywhere. I’ll try working out a solution for stowing it with immediate access, although the likelihood of it being used is remote. 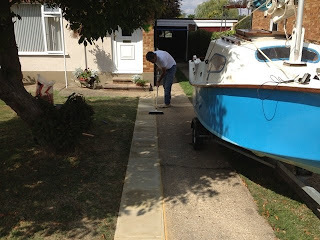 An inspection of the side ballast revealed that Robert did a very good job of cementing in the lead. There’s no way it will shift, even in the very unlikely event of a total capsize. I like the fact that I shall not have to pump water in and out for ballast, as with the original design. I’m looking forward to another day working on ‘Minnow’. Incidentally, I’m still cogitating changing the boat’s name. Until I removed the heavy conduit from the exterior of the mast I could not examine it properly. Removing the conduit was a tacky business, because the tapes binding it to the mast had perished, causing them to become very sticky. 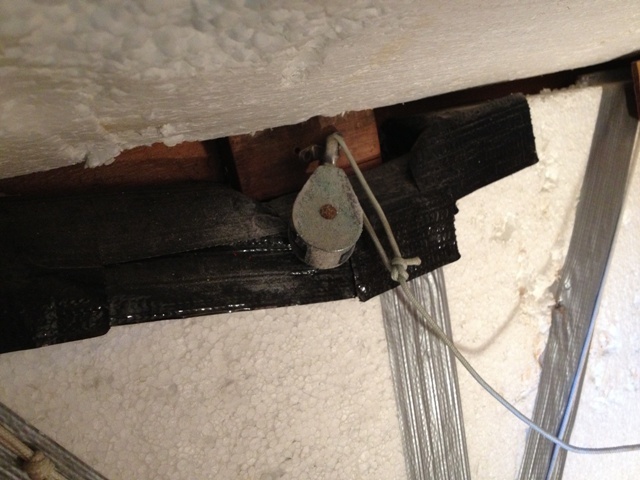 The conduit was also held to the mast with a vulcanized material which was an extremely effective adhesive. I had to vigorously scrape it off with a sharp knife. I found that rainwater had penetrated the varnish in many places causing slight degradation of the wood and staining. At the foot of the mast there was a small gap between two panels where the epoxy had failed, and elsewhere there were similar, but smaller gaps. None of them were serious, and I shall be able to fill them with epoxy. Leather sheathing around the mast had opened up through chafing from the boom and sail. I extracted the copper tacks that kept the leather in place and I found that part of the mast was in pretty good shape, except the tack holes did it no favours. I shall have to fill them by inserting cocktail sticks cut flush with the surface of the wood. 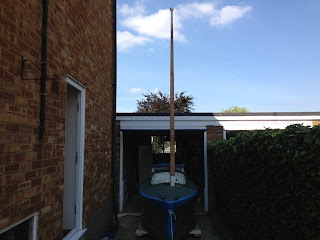 After sanding and scraping the mast for approximately four hours, I had it looking fairly smart. I shall do more sanding before coating it with several layers of paint. 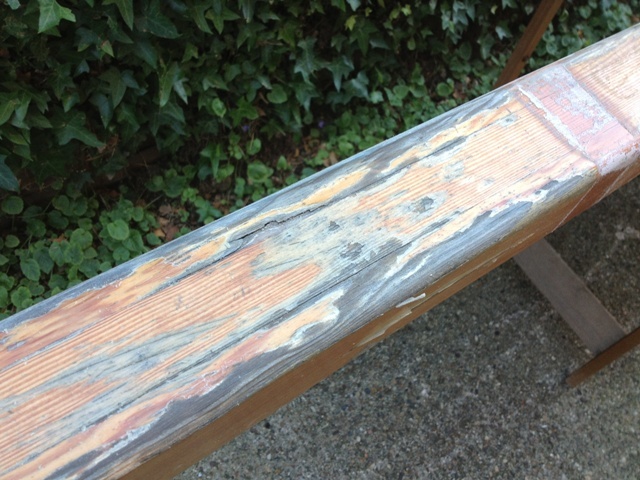 Varnish looks great, but it requires constant upkeep. 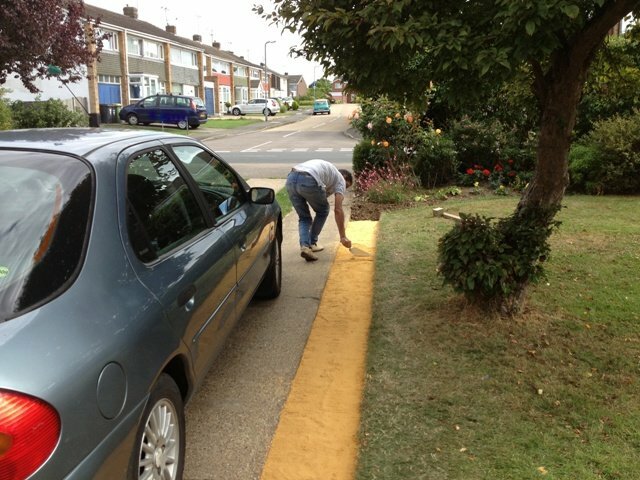 Paint is far more protective and is easier to maintain. Tomorrow I shall look at the steering system to ascertain why it is very stiff to operate. Most probably this is caused by cheap galvanized blocks seizing. 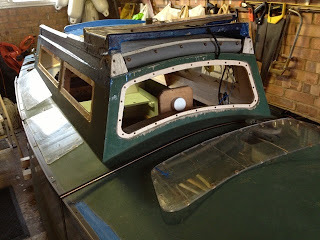 I’ll also examine two rowlocks that are mounted on the transom for the yuloh, one of which is jammed. I’ve had another look at the boom and yard, and I have found that they are not seriously warped. Well, I’ve made a start at getting the boat as I shall want her. Today I had the first real opportunity for examining ‘Minnow’. To fully know what will be required for renovating her will take more time. 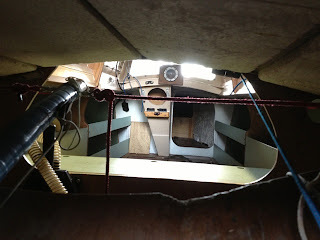 I must remove the wiring from the exterior of the mast so that I can see its entirety. Both the boom and the yard are warped, but their condition may not present problems. Obviously, the straighter the boom, the more easily it will rotate when the sail is being reefed. The cabin top is rough and disintegrating, and her sail is badly chafed. These are some of the negative points, but they are not insuperable to put right. In my hands ‘Minnow’ will never be a showpiece, because as far as I am concerned, she does not warrant being rebuilt. Looking on the positive side, she would appear to have a strong and reasonably fair hull. Her CopperBot antifouling still has life in it. The interior is basic. She has internal buoyancy in the form of polystyrene blocks. However, they are a bit of a pain, because small pieces of polystyrene can accidentally be broken off and end up in the bilge. Why am I looking happy in the photo? Because I know what a fortunate person I am! I have a Paradox! Yes, she’s not the best in the world, nor will she ever be, but I think I can bring her up to the standard I require. I am convinced I have found a worthwhile project that will engage me for months to come. Like all of my mistresses, she’s not going to be cheap. Richard Green left a comment yesterday including these words: I hope the threatened/promised inclement weather doesn't put you off doing a bit more tomorrow, and letting us know about it. 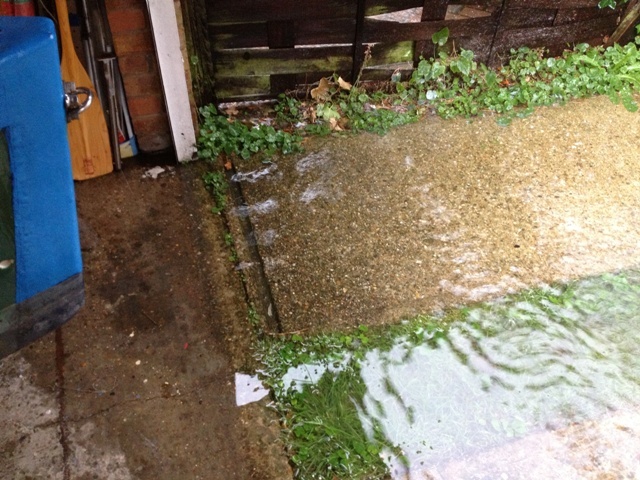 I hadn’t twigged on that Essex was in for a bucketful of rain today – more like a flood! What with other things on the agenda, I didn’t have time for working on the boat. When an occasion for doing so arose late afternoon, I was preoccupied with saving things from a flood in the garage. 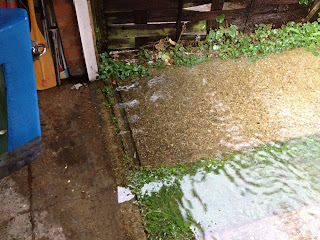 A torrent of water rushed down the drive, straight into the garage. As I type, rain is still falling, and the forecast is for it to continue for several hours. My main concern is that the water will rise high enough to short out the freezer. As far as I can see, there’s nothing I can do to prevent it happening. 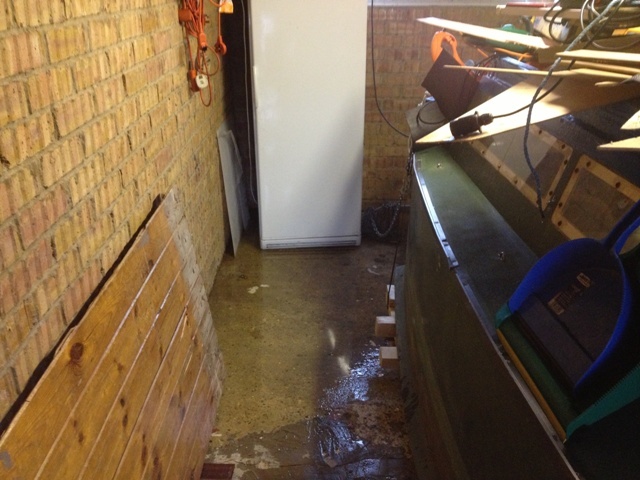 My neighbour was trying to get rid of water in his garage, which is adjacent to mine, but I fear that will be an impossible task. He remarked that the boat would float, and I jokingly suggested she be renamed, ‘Noah’s Ark’. She looks a bit like an ark. Any spiders left in the garage will be trying to enter her for sure. Well, I’m resigned to the flood getting worse, which will not do the foundations any good, and they will remain damp for weeks to come. Al least, the rain is not coming through the roof, which is a blessing. Things can only get better after they get worse. Before I could clean the interior of ‘Minnow’, I had to remove a Campa Potti from the forepeak. I noticed it was much bigger than a Porta Potti my family took camping last year. If ever I cruise ‘Minnow’ on inland waterways I shall take the Pota Potti, but for estuary and coastal sailing I shall rely on the well tested, ‘bucket and chuck it’ routine. I vacuum cleaned the whole of the interior of ‘Minnow’ and I hosed and scrubbed her exterior. She’s not exactly shining like a new pin, but when I’ve attended to a few blemishes and painted her, she will look a lot smarter. The mainsail is badly chafed at the head and foot where it comes into contact with the mast. The boom fitting for the mainsheet and topping lift is rusty, but structurally strong. 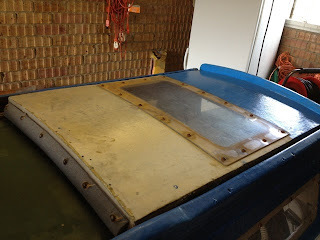 Parts of the cabin top are coming adrift and the aft end requires sealing to the deck. 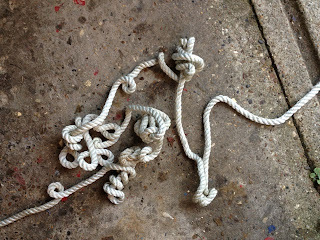 I found nine fenders and one strange anchor with a chain, plus thirty-eight metres of three-stranded nylon warp. Untangling the warp took over half-an-hour! I think I shall be able to sort out the leaks at the top and bottom of the drain pipe that allows water to exit from the base of mast box through the bottom of the boat. The mast box requires sealing either side of the aft panel. The blocks for the steering system have to be replaced, because they do not run smoothly. The vent cover in the transom will require sealing, and the yuloh rowlock has seized. There are certain refinements that I can do to make things run more smoothly; for example, I can replace the rudder up-haul line with a thicker one. She does not have the standard metal loops for stowing the yuloh and the sail. While cleaning the boat I noticed several things I shall want to improve. She does not have an outboard bracket. 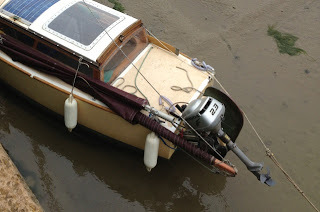 Her previous owner managed without an engine, but I have to contend with very strong tides on the River Crouch and the Thames Estuary; therefore I shall be tempted to fit a bracket for my Honda 2 HP outboard. Sean wanted to know how the mainsheet can be led into the boat to avoid fouling the engine. This arrangement on 'Faith' partly solves the problem. Jim says it's OK, providing he keeps an eye on things. 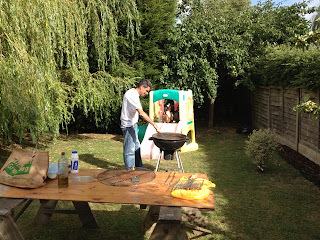 Between doing other things I had a chance to make an initial inspection of ‘Minnow’. 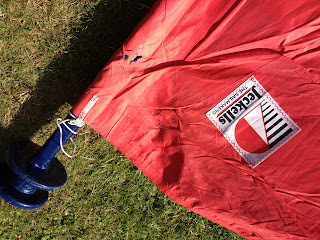 I had to remove the sail and boom from the cabin before I could gain access to the forepeak. There I found several fenders and a camping toilet. The floor lockers were mostly empty, apart from numerous small pieces of polystyrene that had found their way there from the hull insulation. I temporarily removed two concrete castings from the floor lockers. These constitute part of the ballast. The other ballast is in the form of lead pigs which I have yet to see, since they are encased either side within the hull next to the chine logs, and I cannot see them without first unscrewing wooden capping pieces. I wasn’t the only one doing an inspection. My grandchildren and great grandchildren took an intense interest in what they named, ‘The Wreck’. As far as they were concerned, she was a fabulous pirate ship. 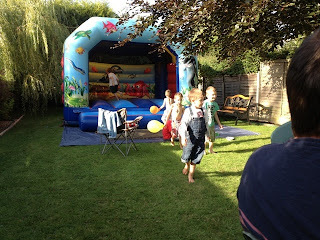 My daughter didn’t like the name the children had chosen; nor did she think ‘Minnow’ was appropriate. She said it was a ‘rubbish’ name, and vowed to come up with a better one. She challenged the children to do the same, and guaranteed she would have them send me a text message with their suggestions. According to the BBC weather forecast, tomorrow should be fine and sunny, which will help me continue my inspection and start the job of cleaning the boat. 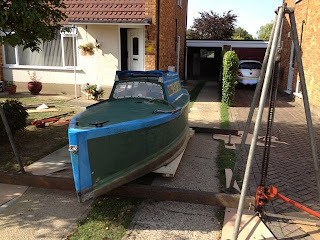 She arrived this afternoon after travelling all the way from Norway strapped to Gary McCourt’s boat delivery trailer. Moving her from the trailer to her trolley took about an hour. Gary has devised a clever way of doing it by the use of four pyramidal supports and two crossbeams. Ratchets at each support controlled the vertical movement of the crossbeams under the boat. Gary was able to lower her with a good degree of precision, so that she was gently placed onto her trolley. I wondered if the castors attached to the underside of the trolley would be strong enough to take the weight, but they showed no signs of disintegrating, for which I was very pleased. 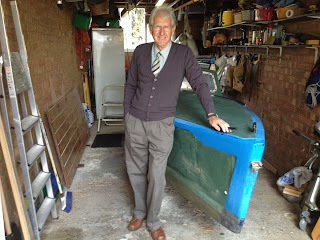 My neighbour, Gary and I pushed ‘Minnow’ into her boathouse, i.e., the garage. So far I haven’t been able to examine her in detail, but I shall take time over the next few days to assess what work may be required before her first sail with me. 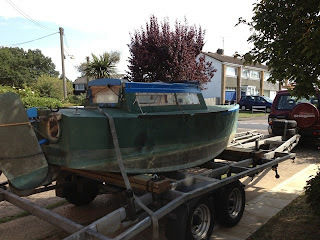 Of course, I shall have to buy a suitable road trailer for transporting her to the water. 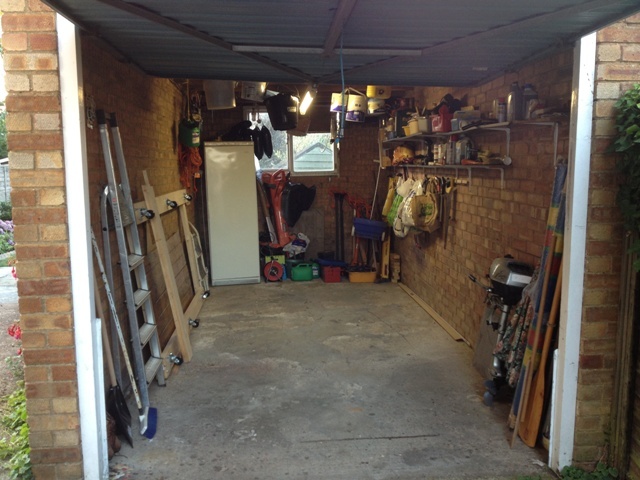 The garage has been swept clean; all cobwebs have been removed – I found a new broom for a new boat. Hopefully, the road will be clear for the delivery at mid afternoon tomorrow. The excitement is building, but my hopes must not be too high. For sure there will be things that I shall not like; however, the good points will surely outweigh the bad ones. Will I be shocked, or will I be elated; perhaps neither. I may be moderately pleased, or even fully satisfied. Never before have I acquired a boat without first seeing her close to hand. I am not anxious, but I want to get over the first meeting, which is rather like a blind date. Incidentally, I met my wife through a blind date, not of my choosing, but to satisfy a friend who was unable to attend one that had been arranged for him. This is a bit of a gamble, but the odds are good. After all, ‘Minnow’ was built to the plans of Matt Layden’s Paradox, with a few minor changes. The basics are there, and possibly a lot more, because she has been tested by two previous owners. 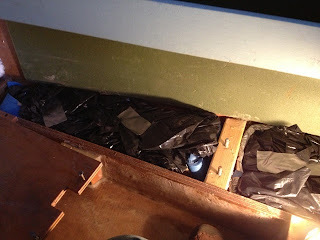 I understand that some of the lead ballast has been supplemented with concrete ballast. 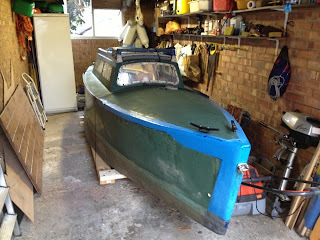 I’m hoping it has been done well, and that the boat sits on her designed waterline. 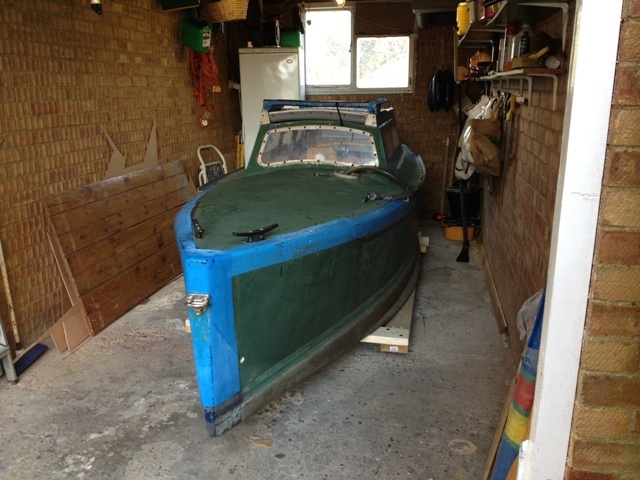 If all goes to plan, ‘Minnow’ should be snug in her boathouse by tomorrow evening, and I’ll know the answers to most of my questions. The Dickens novel, Great Expectations is full of twists and turns, disappointments, doubts and the unexpected, but finally all ends well. Pip, the central character, is reunited with Estella, and he sees no end to their relationship. The unexpected happened to me today, for ‘Minnow’ did not arrive, but there was no certainty that she would. A reply to a text message informed me that her ETA would be on Wednesday afternoon of this week. Well, that’s not long to wait, since I’ve been patient for weeks, knowing that the boat could not be moved from Norway in less than three or four days, and I would have to wait until she could be delivered. 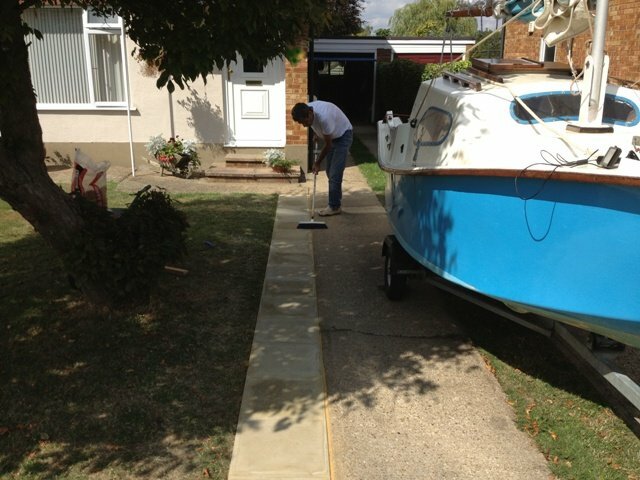 Meanwhile, I’ve been attending to the garden, and my son-in-law has been doing most of the graft. He prepared and laid a path beside the driveway, and he undertook other tasks such as levelling ground at the bottom of the garden and laying turf to replace bare patches in the back lawn. My daughter painted the pergola. I simply mowed the lawns and watched them work. This is a great time of year for barbecues, and on Sunday afternoon we had a sumptuous feast grilled by the Master Chef – my wonderful son-in-law. For more than a month our house has been filled with summer visitors. Today, one lot went and another arrived. Visitors often do the unexpected, so life is by no means dull. 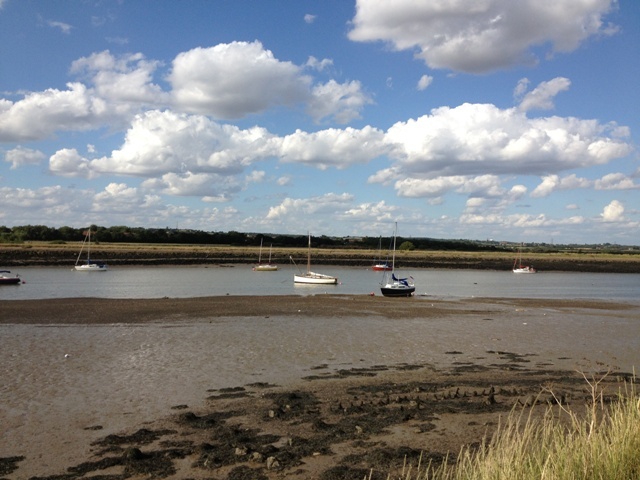 I never cease to be excited by the ever changing scenery beside the River Crouch at Hullbridge. Sunrise and sunset, ebb and flow, whispering winds, swans, boats and people; the passing of the seasons; colours, light and shade; clouds, bright and fluffy, clear blue sky; falling leaves and black mud - these are the riches of this very special place. 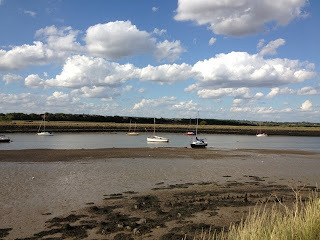 Hullbridge is a slumber land for dreamers – dreamers like me. Yachts restlessly wriggle on the falling tide; then sleepily they rest until awakened by the urgent flood. They strain at their moorings, longing to be off, longing to curtsy in response to the wind; longing for fulfilment, just to be what they were meant to be: pleasers and charmers, dancers of the sea. Moonshine, shadows, sparkling stars; spindrift, spray, rainbow light; these are jewels of joy they bring. My excitement is heightened by the imminent arrival of ‘Minnow’, a magical mistress seeking a new master who will cosset her; one who will dress her and make her fit for purpose. She is not the prettiest Essex girl, but she has inner strength; beneath her scars she has character and dignity and fidelity. She will satisfy her owner, and he will be content. There is a little pang in my stomach and a tinge of sadness that a chapter has ended, but what a chapter! And a new one is about to begin! I saw the tail end of ‘Sandpiper’ disappearing around the corner as I waved her goodbye. Whether she was sad or not, I do not know. She had a new Master. She was off to Graffam Water for a life of luxury, a life of indulgence. No more tides, no more frightening maelstroms - real or imagined - no more endurance passages, no more headlands, nothing but picnics and gentile sailing around the lake. 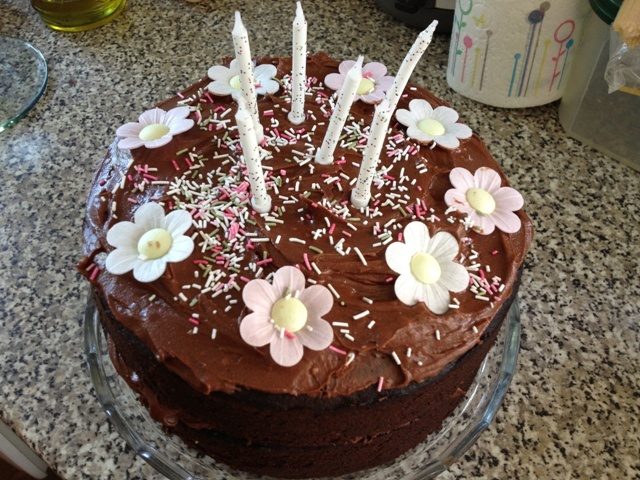 There will be tea parties galore and sunny afternoons …….. Pottering as Potters should potter. Hopefully, a fresh page will be turned this coming Monday, 19th August to reveal ‘Minnow’, a seasoned Paradox sailboat, all the way from Norway, repatriated to her country of birth. She will smell the tang of sea salt while crossing the Strait of Dover. She will feel the ferry lifting to the swell, and know that she will soon have a new Haven and a new Master who will give her adventures by the score. Sea billows roll, roll on, and bring her home safely. A boat is unlike a car in that she is very individual, especially when it comes to handling. Cars are much of a likeness. They have steering wheels, accelerators and brakes. Drive one car, you can drive another. There are no brakes on sailboats, and speed is down to sail handling. Steering is by tiller or wheel. Because of their individual characteristics, boats will respond differently when experiencing identical conditions. Their helmsmen have to know how to get the best out of them. Experience counts. Put the boat into the hands of a novice, and she will not be sailed to her maximum potential. When the trailer is not attached to the towing vehicle place a support under the back end to stop it from tipping, especially when someone is in the cockpit. 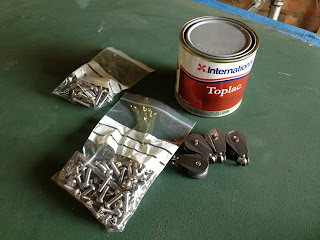 Before launching the boat, cover the vent holes on the wheel caps with waterproof tape to prevent water entering the bearings. Remove the tape after retrieving the boat. Use a long rope with a turn around the ball hitch to lower the trailer and boat in the water. Have a painter to hand for securing the boat while the trailer is being retrieved. Have a stepladder or stool handy for getting in and out of the boat. Lay the mast and Genoa luff rod centrally on top of the boat. The top of the mast needs to be kept clear of the hatch. 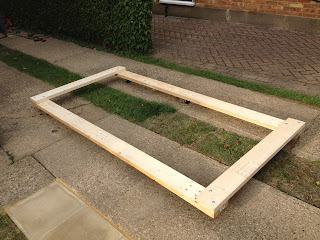 This can be done with a helper or by an improvised support. I use a padded stool on top of the lazarette lid. Insert the bolt through the tabernacle and mast. Make sure the mast is placed centrally in the tabernacle. 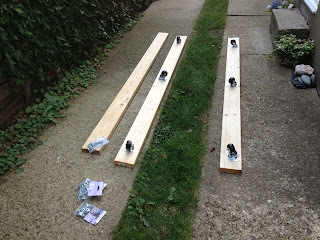 Shackle shrouds to the chainplates. 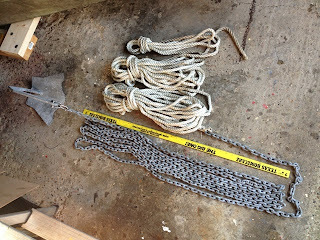 Attach a line to the eye at the bottom of the forestay to which the tack strop is shackled. This line is pulled when the mast is being lifted – best done by someone standing in the cockpit. If you are on your own, the line can be passed through the forward hole of the tack plate, so that it can be pulled when the mast is being lifted. Temporarily secure the line. 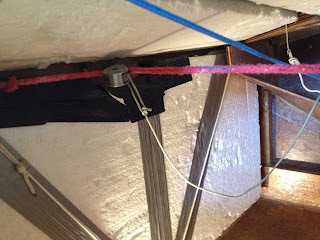 Alight from the boat and pass the line under the forward crossbar of the trailer’s winch mechanism and thread it back through the eye at the tack end of the forestay. Pull down the line to tighten the forestay. 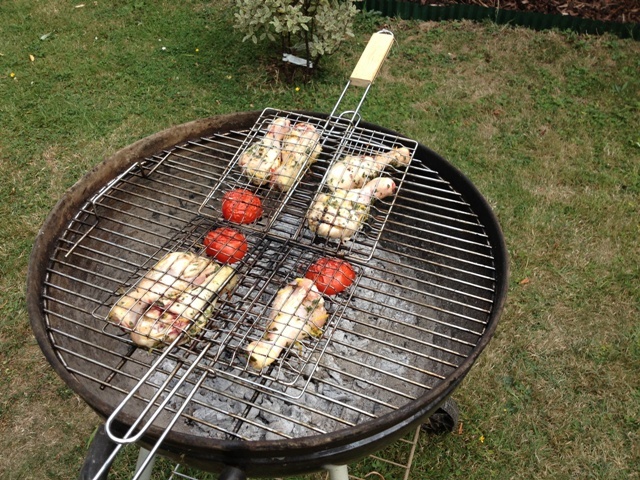 If you find this difficult, tie the end to the winch crossbar and use a rod to make a tourniquet. The lower tack strop can then be shackled to the tack plate. Remove the tourniquet and line. The mast is now rigged. Place wooden cheeks either side of the mast within the tabernacle. Slot the boom onto the gooseneck, and pass the lower end of the fixed topping lift through the upper shackle of the fitting at the aft end of the boom. Secure the end of the topping lift by making a rolling hitch. This can be used to adjust the boom height. Shackle the mainsheet block to the boom. To raise the boom when not sailing, lift it and pass the topping lift under a cleat on the starboard side of the boom, then under the port cleat. This is a good time to ship the rudder and the outboard - both in their fully raised positions. The boat performs well when on her designed waterline. Therefore make sure the bow has sufficient weight to keep her trimmed correctly. Lead or water ballast forward of the forward bulkhead will do the trick. She will not go to windward efficiently unless she is trimmed correctly. Think about reefing when at the upper end of Force 3. From thereon, reef both the Genoa and the mainsail to achieve a balance. The mainsail is easily reefed when the boat is hove to, i.e., with the foresail backed and the mainsail freed off to leeward. The tiller should be secured to leeward. In this position lower the sail while manually rolling it around the boom. You can reef to the lower batten, but in extreme conditions, you should extract it and insert a couple of towels before rolling further. This is to raise the boom while keeping the sail flat. Make sure the topping lift is slack to allow the sail to set properly. Keep the luff very taught. Before lowering the centreplate remove the securing pin. Lower the plate steadily until fully down. The support bolt passes through a curved slot, not a regular hole; therefore when the plate is being lowered it slightly moves aft. It may be necessary to push the rudder down, until it is fully down. If it is not fully down, the boat won’t sail to windward properly. When the boat is at anchor it is better to have both the plate and the rudder raised. The tiller can be lifted to allow the lid of the lazarette to be raised. It can also be separated from the rudder by sliding it aft. 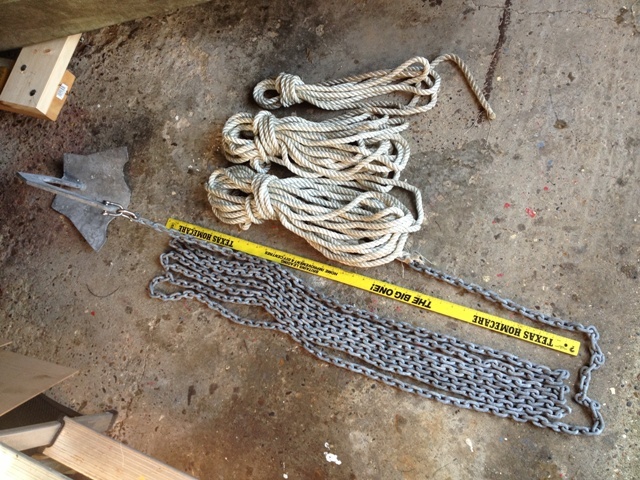 Free-off the anchor chain and flake about 6 or 7 metres of warp onto the cabin top. Have the anchor ready on the foredeck for letting go. Ignite a match or gas lighter; hold it over the burner and turn the knob anticlockwise. The canister can be released by lifting the lever. I never did this until replacing a canister. I was vigilant not to accidentally turn the knob on. It is a good idea to periodically check the battery voltage with a voltmeter to make sure the solar panel is doing its work,. That’s because there is a possibility that the plug may not be correctly fitted into the socket. The battery is maintenance free. If the boat is trimmed to her lines, the cockpit will drain, but if she is down at the stern she won’t fully drain. 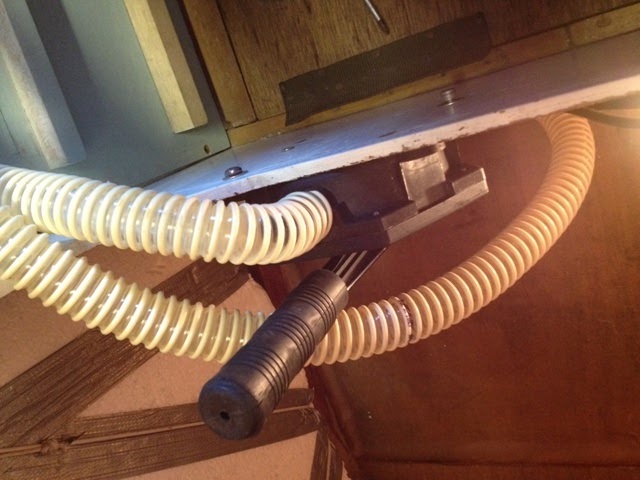 It is best to keep the plug in the cockpit drain because under certain conditions water can be siphoned into the cockpit. The plug also keeps rubbish out! 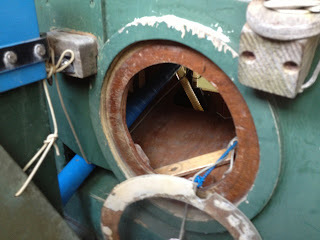 There are two tiny drains at the very aft of the cockpit that need periodic checking to ensure they are not blocked. The lid of the lazarette can be kept open by a line under it attached to cleats on the outside of the coamings. Well, I’m looking forward to meeting ‘Sandpiper’s’ new owner on Saturday, when he comes to collect her. The Ebay auction brought a satisfactory result. Although I lost financially, I certainly gained experientially through my involvement with the boat. I took her on knowing there would be work to do, but I didn’t realise to what extent! The biggest and most important aspect of renovating her was rebuilding the centreplate box in the proximity of the through-bolt. The repair was a complete success, and it improved the structure of the box. I felt pretty good about it. Almost everything required attention, but now she is in good working order. There are still things that can be improved, such as installing replacement windows, building stowage racks in the cabin and adding berth cushions. Later, she could do with a new suit of sails, and her underwater parts could be repainted and antifouled. Maintaining boats is a continuous business – pleasurable if done a little at a time when the need arises. 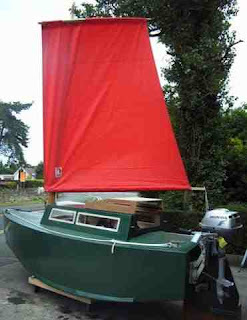 No doubt ‘Sandpiper’s’ new owner will have a lot of fun tinkering with her and sailing her. I understand he will be sailing her on inland waters. She’ll be a super boat for day sailing, fishing, motoring and picnicking. I sincerely hope he will be very pleased with her. Wicks and Homebase were the sources of materials for building ‘Minnow’s’ trolley. This morning I bought three planks, plus nuts and bolts from Wicks. By visiting two Homebase stores I was able to obtain six heavy duty castors – two of them from Rayleigh and the others from Vange. Officially, these castors are no longer stocked at Homebase; therefore I was fortunate to find them. 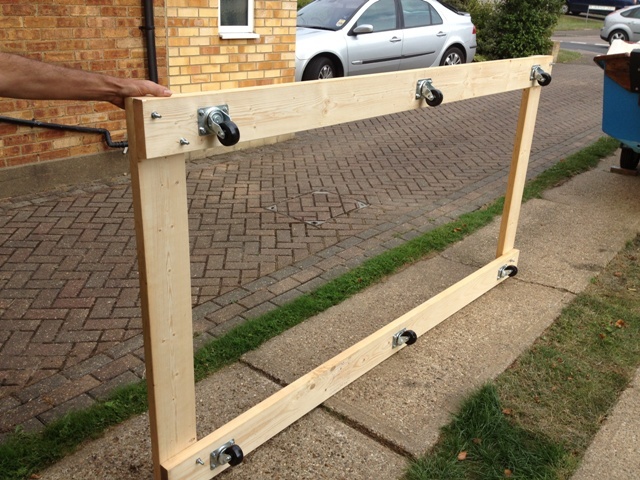 Within an hour-and-a-half of arriving home, my son-in-law and I finished making the trolley. We used eight bolts to hold the frame together, and we attached six castors to the underside of the frame. 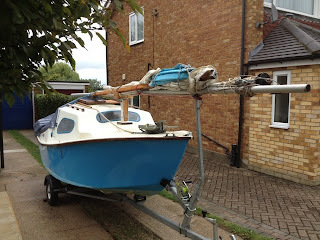 Hopefully they will be sufficiently strong take the weight of the boat and her trolley. I believe the trolley will be robust enough to withstand at least six months of constant use. 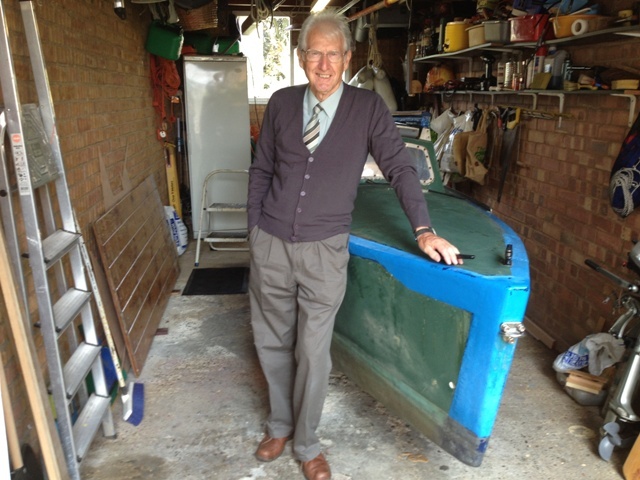 The advantages of having a trolley are threefold: Importantly, I shall be able to receive the boat when she is being offloaded from the delivery trailer on 19th August, and I shall be able to convey her to my garage where she will be out of the elements. 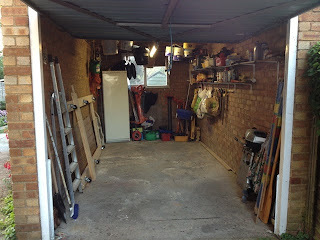 I’ll also be able to conveniently move her in and out of the garage for working on. This temporary facility will give me time for acquiring a suitable road trailer. Just now I am uncertain as to what will be the best type of trailer. Whatever, I end up with will depend on the cost. I don’t want to spend more on her trailer than on buying her, but I fear I shall have to pay more for a trailer.